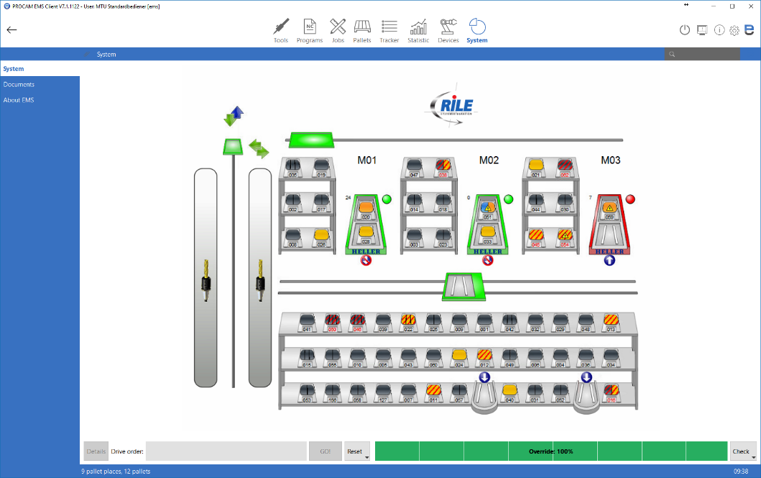 EMS is the software for the control of flexible manufacturing centers and for the planning, managing and monitoring of production orders on NC machines. It provides all necessary features and functionalities for the control of existing and required tools, as well as for the management of underlying NC programs and their transmission to the machine for execution there. 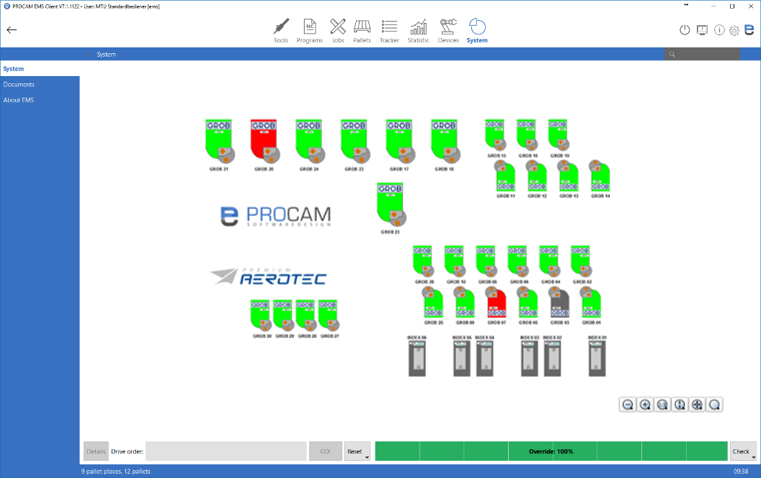 Tool management for an unlimited number of virtual and real tools, which visualizes the current positions and status data of all tools, in real time. NC program management for an unlimited number of programs. All programs are saved (automatic history), including their existing versions, and can be conveniently sent from the EMS to the machine or vice versa. 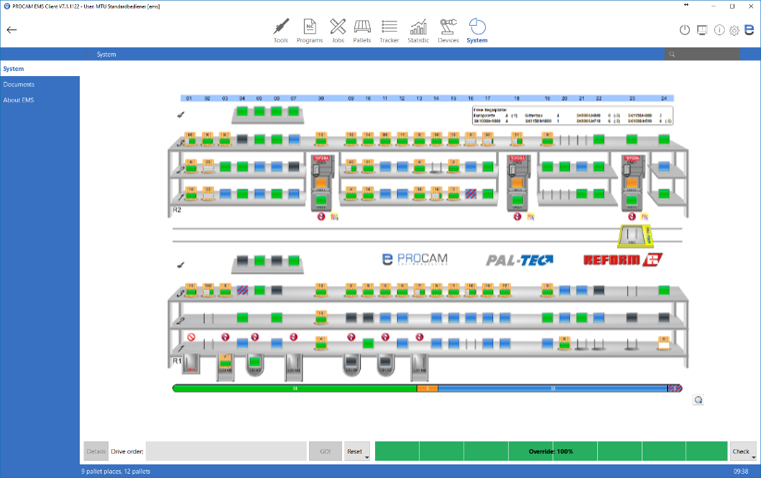 Order management with the possibility to manage work plans and production orders. Constant overview of production progress and necessary tool movements. Pallet management for different pallet types as well (e.g. normal, heavy, long pallets or tool pallets). It contains the fully automatic and semi-automatic operating modes, and allows comfortable multi-sided machining. The tracking tool displays the NC programs that are currently being processed and the current spindle position. It is possible to accurately track the next required tools in the machine. Regardless of the manufacturer of a workpiece or tool carrier, we control your transport system with intelligent algorithms that contain many optimization options, also for your production system. At PROCAM we attach great importance to the user-friendliness of our software. The software is constantly being further developed, and contains many practical functions. The software is completely developed in Berlin, which ensures short communication lines for you, and means changes can be made quickly by us in all areas. And just in case you need assistance, you will get reliable help from our 24/7 hotline. 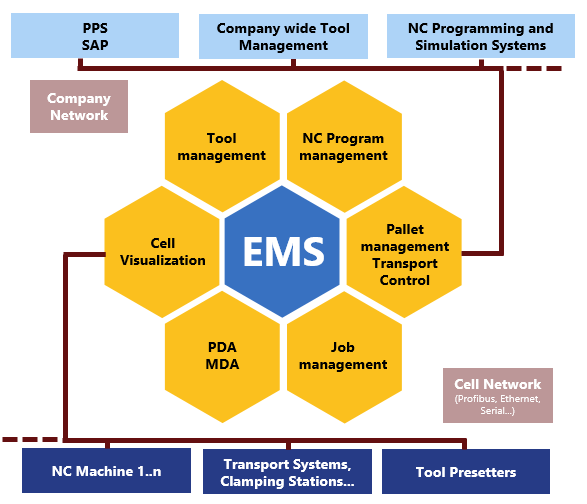 EMS can be used as a controller for pallet, tool or part automation, and helps meet all requirements for your automation system. Thus, the system takes over, among other things, the management of the individual workpieces, devices, pallets, grippers and production orders, and offers a perfect overview of the current state of the plant. 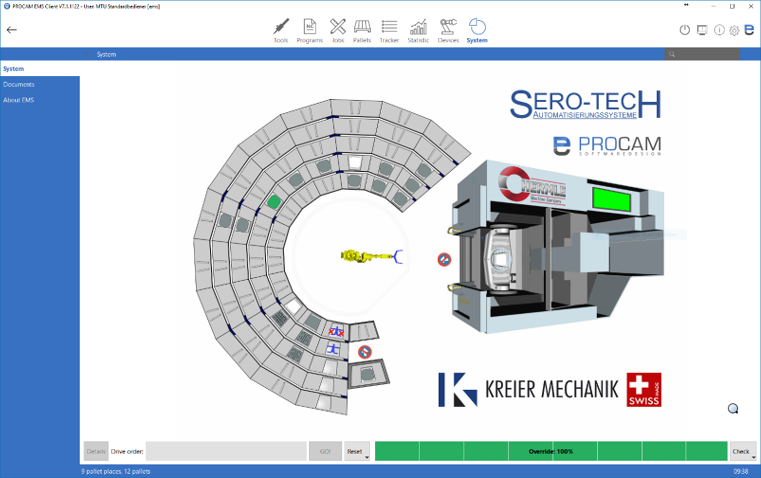 Flexible manufacturing systems based on a tool automation, in which all tools are stored in a central magazine and automatically loaded by order into the tool machine. Standalone machines, in which our core modules of Order, NC and Tool Management can be used. The most recent systems, in which the workpiece itself instead of a workpiece carrier is loaded directly into a tool machine. Such systems can also be mixed with pallet automations.